Our love story began long before we could possibly date each other, or would possibly be interested in each other. When I was in elementary school, my mom would drive from Springville to Orem in Utah where we lived to let my sister Jocelyn and I play with our cousin Amanda. Sometimes, the little girls from across the street would come over to play with us too. I would see their brothers riding their bikes in the street and playing outside. One of those little boys was Tyler, and those little girls were my future sister-in-laws! The Parcells lived across the street from my cousin’s family. 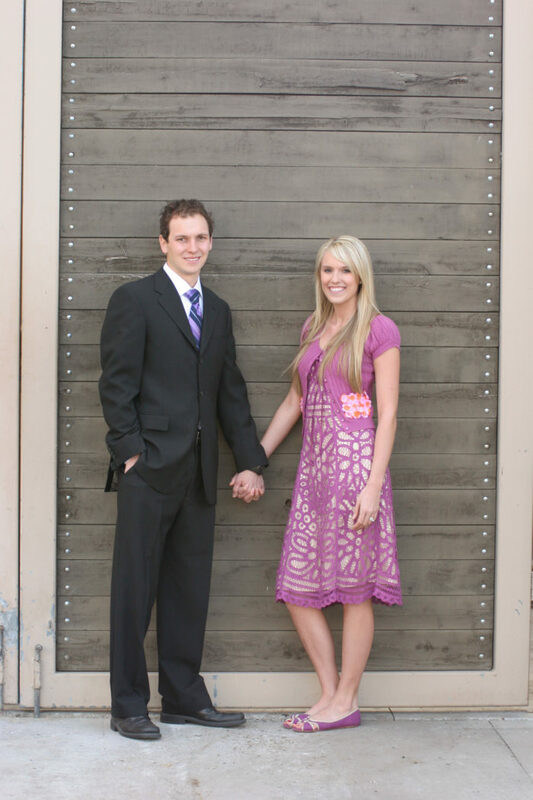 Fast forward 12 years and I’m living in an apartment with Amanda in Provo, Utah attending BYU together. On my birthday back in 2007, we met our friends at their apartment to go hot tubbing with our girlfriends. We ran into Tyler and his friends, who I knew, on our way. We were briefly introduced to each other and I remember saying something like, “I know your family! 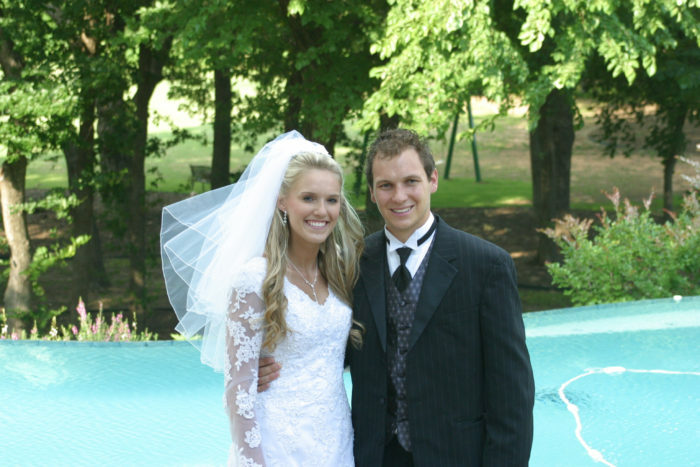 You lived across the street from Amanda growing up.” He happened to run into me a few weeks later at Ruby River, a steakhouse that I worked at and he pretended to not know my name and had to look at my name tag. That’s his story and he’s sticking to it! Different people threw dance parties every weekend in that college town, so a few weeks later we walked a few doors down and were having fun with our friends on a weekend night chatting and dancing. We ran into Tyler and some of his other friends and we exchanged numbers and agreed to meet at his friend’s house for a fire in the back yard later that night. We did so and I started talking to Tyler and thought he was a really nice, fun guy. We continued to hang out with his group of friends, going to movies and getting together. He asked me a on a date a couple weeks later and we went to the classic Olive Garden and played mini golf. After mini golf, we decided to meet our friends over at his parent’s hot tub but we had to stop at the house to get a swimming suit he had left there. As he walked into the door, his aunt opened the door and she couldn’t see that I was still standing there. She said, “DATE MAN! How did it go? !” And then she saw me and was like, “Oh!! Ha ha I’m so sorry! !” It was so funny and I had a lot of fun; it was the first time that I thought we could be more than just friends but I was worried that it might ruin our friendship if it didn’t work out! He was such a funny, cool person that I told my friends I would be bummed if dating and then it not working out ruined the fun that we had together. Things continued to go well and he invited my friends and I to Lake Powell to stay on his parent’s houseboat with him and friends for a week. We were so excited! Amanda told me not to ruin the trip for her…she told me that I had to continue dating him until at least after the trip was over so we wouldn’t get uninvited. Ha! That wasn’t hard to do. We had such a great trip. I met his parents and they were really nice and welcoming. His dad even said, “whoever ends up with you will be a lucky guy.” Phew…moving fast! We continued to date that summer and I started falling for him. A few months later, while on another trip to Lake Powell with his family, I muffled, “I love you” to him right before bed one night, half hoping he wouldn’t hear. He said, “Did you just drop the L Bomb? !” Ha ha ha…embarrassing! Everything continued to progress well but the pressure that his family was putting on him to put a ring on it started to stress him out! He started acting kind of weird and one day as I got in his truck after he picked me up from a date I said, “The pressure isn’t coming from me! Just so you know, if you asked me to marry you right now, I would say no! !” I was thinking this might not work out after all. I planned to drive up with Drew, his brother, to meet him at the family where he was already at one night. Drew was bringing a date and we were going 4-wheeling. I texted Drew while waiting for the bus to pick me up from BYU and drop me back off at my apartment and told him that I wasn’t going. He asked why. I told him that Tyler was acting weird and I just didn’t think it was working out so well. He called me and talked to me for 30 minutes telling me all of the reasons why he thought Tyler and I should stay together and how happy he was and that he just didn’t know how to show it sometimes. He convinced me to come up to the cabin, so a couple hours later, he picked me and his date up and we drove up together. The date was a lot of fun and I thought things were totally back to normal. What a relief! Tyler continued to act a little worried about the pressure and prospect of getting married. I was kind of fed up with it, because I honestly wasn’t ready to get married either, so one night I invited over some friends to my apartment. They were boys. I’d never dated any of the them, but I knew that one of them liked me. They were really fun so we were just hanging out, having a great time! Tyler showed up and he didn’t love what he saw. He assumed this was my way of telling him that it wasn’t going to work out and we got in a little fight. I thought we were breaking up. The next day, he told me that he was willing to fight for me (yes, he said those exact words!) and that he wanted to be with me. Things were pretty smooth sailing after that! Tyler kept asking what I wanted to do for New Year’s Eve. He wanted it to be really fun and special! I decided to do something very Texas-like and take him to Billy Bob’s Texas, the World’s Largest Honky Tonk. If you’re unfamiliar with a Honky Tonk, it’s basically a big dance hall. We got there at about 10 pm and tried to walk in. Apparently you can’t go in unless you’re 21 and have your ID…which I had left at home….which was 30 minutes away. We called my parents to see if they knew of any other fun things we could do and my dad said that he would leave the house and bring me I.D. He was insistent so I let him! I kind of wondered why he was willing to drive so far but was grateful so we could have a fun night. After we got into the honky tonk, we danced for a little bit and then it was almost midnight so we moved closer to the stage and the band starting counting down from 10. Background: his family plays a game called “rabbit.” It’s so random, but you say the word ” rabbit” to everyone in the family to eliminate them. The last person standing wins! I had never won so the clock struck midnight and I said, “RABBIT!” Tyler thought I said, “Where is it? !” referring to the ring. I had absolutely no idea he was proposing or had a ring. He had completely thrown me off a couple days before. We were sitting at a movie theater and my sister was dating someone at the time who wanted to propose to her. Tyler said something like, “I wouldn’t be ready to get married right now.” I was so disappointed! So…back to his proposal. He thought when I said, “rabbit” that I said, “where is it? !” so he just pulled the ring out his front pocket because he figured if I already knew then he would just give it me to ha ha ha! Side note: OF COURSE I wouldn’t say “where is it? !” Ba ha how tacky is that?! So…he pulls the ring out of his pocket and I think he’s getting his phone out of his pocket. I’m thinking, “Why would I need to call someone right now?! It’s so loud you can hardly hear a thing!” I then see the ring and scream!! 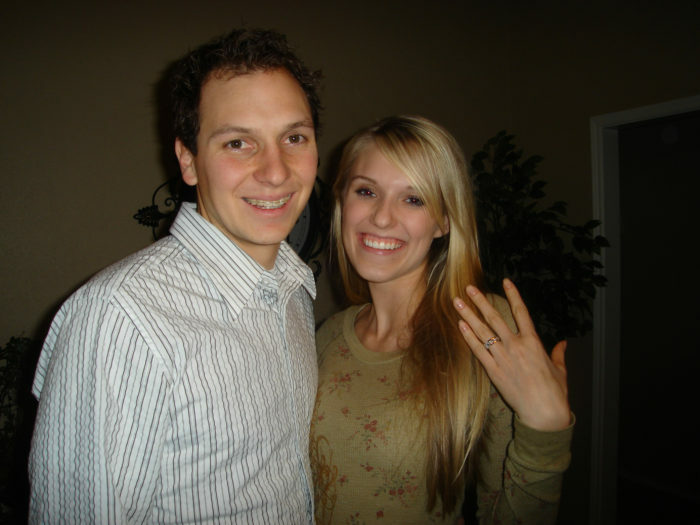 I had NO IDEA that he was going to propose!! It was a hilarious proposal and so “us” because we love to laugh and it just cracks me up. Now every single New Year’s Eve when the clock strikes midnight, we share a laugh (and a kiss!) remembering this proposal. 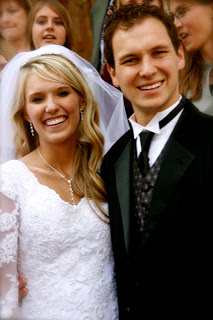 We got married on May 9, 2008 in the Salt Lake LDS temple which was exactly one year from our first date on May 9, 2007. Tyler kept all of our ticket stubs and pictures from that first year and made a collage out of it for me. My favorite part of the whole day was walking in to the room to be married and seeing everyone from every aspect of our lives who loved an supported us. It was so special. Our love story had its downs and our ups and I can say after being married to him for 10 years that he just gets better and better. He is is incredibly thoughtful (he let’s me do things like take a nap for 2.5 hours on Saturday after I have already been gone all day with friends and at the gym because he thought, “I really need a break, and if I really need a break, I know Jenica needs a break”). Also, THIS STORY. He completely ignores my faults; it’s like he doesn’t even see them which has been an incredible example for me. I think one of the most important qualities in someone is to be able to laugh through life. Life is hard and he helps me to take it too seriously and to laugh through the hard times. We grew closer while struggling with infertility which I think is difficult to do and I attribute that to him and his incredible humor. I love you, Tyler! I want 10 years more with you. And 10 years after that. And 10 years after that again and again. Loving this love story feature? Take a look here for more of my favorites! Such a great story! Love it! Thank you for sharing this with us ? Thank you for reading; you’re so sweet! What a beautiful story..my niece is getting married over July 14th and the rehearsal dinner is at Billy Bob’s. HA!!!! I am so excited!!!!! Oh my gosh, how cool!! That sounds like a blast! This is such a sweet story. I am glad for you that you are still together. You two and your twins are adorable. Thank you so much, Katie! You are so sweet!! So sweet and funny! Congrats! Thanks for sharing! What does your hubby do for work? Just curious if it matches his personality! So cute! Loved learning more about your story! Such a cute story! I also dropped the L bomb first! Haha Loved reading your story! Happy Anniversary! Ha ha I love it! We are twins! 😉 Thank you! Beautiful story. You are a beautiful couple, and you look like a great person. Thank you for sharing your moments with your readers. You are a natural and spontaneous person……. I really like your posts. thanks! Sorry if I wrote something wrong. I do not speak English fluently. hahahahah.